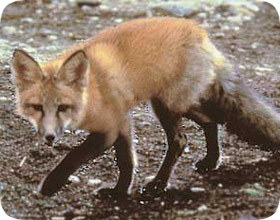 1) Eliminate whatever is attracting foxes to your property, such as garbage, and easily accessible chicken coop, etc. 2) Use a very large live cage trap. This is not easy. Experienced trappers only. 3) Use a paw-hold trap to catch the fox, then shoot it. This is what the experienced fur trappers do. It is not easy, not humane, etc. If you raise chickens for a business or for pleasure, having a fox around can mean a loss in business and poultry. Because of that you need to know how to get rid of a fox. The problem is that a fox is as smart as… well a fox. When a fox finds a way to get on your property and to feed itself then it will more than likely keep coming back. You may not even know where the fox is coming in from, but finding the location is important if you hope to keep it out. A chicken coop is one of the places that will attract the most attention from a fox. But how do you get rid of a fox in the chicken coop? For starters you have to make sure that it cannot get in. You do that by reinforcing the fencing around the coop; that means getting at least a half inch aviary wire. You should also get the same type of fencing underground so that the fox cannot dig its way in. You will want to bury this 6-12’ under the ground. It will help to have a motion sensor that will scare the fox away as it gets close. Foxes may eat chickens, but what about your pets? Read about Are Foxes Dangerous to Pets. Go back to the main Fox Removal page for more information about how to get rid of fox yourself.